Forgive me if I’m a little distracted these days, but my conference is coming up in less than 3 weeks. 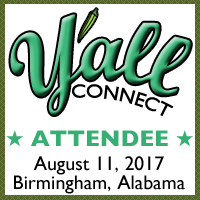 Y’all Connect 2017 will be here in Birmingham soon, and I’m working overtime to get ready. I hope you’ll join us. We have seven speakers — five of whom are returning favorites — to talk about digital marketing and more. I’ve got lots of fun stuff on the agenda, and not a lot of time left to put it in place. It’s Aug. 11 at Rosewood Hall in Homewood, just $149 for the day ($249 for VIP tickets). Feel free to ask me anything in the comments below or through the contact form.